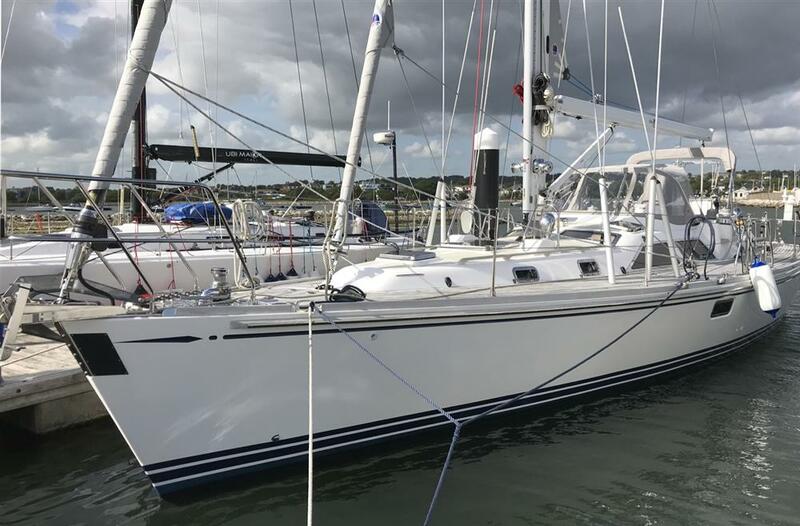 Having recently sold her sister ship "Adina" we are delighted to now also offer for sale "Elmo III"
Lying Poole - viewing is highly recommended. Solid hand-laid fibreglass layup with no core and using vinylester resins and Isophthalic gelcoats. The hull is laid up with epoxy barrier coats below the waterline for optimal protection against osmosis. 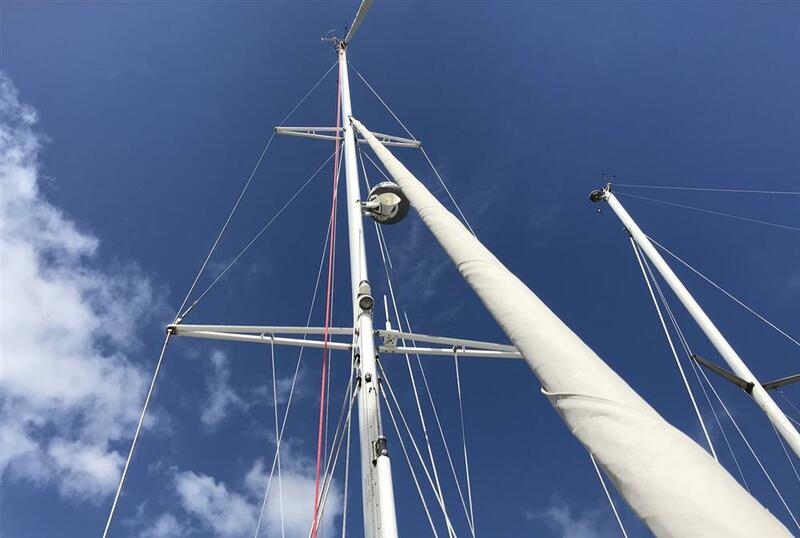 RCD Note: We understand the yacht is compliant with the European Union Recreational Craft Directive and is categorised A (unrestricted offshore). Oil change pump built in as standard for engine, generator, sumps and gearbox. 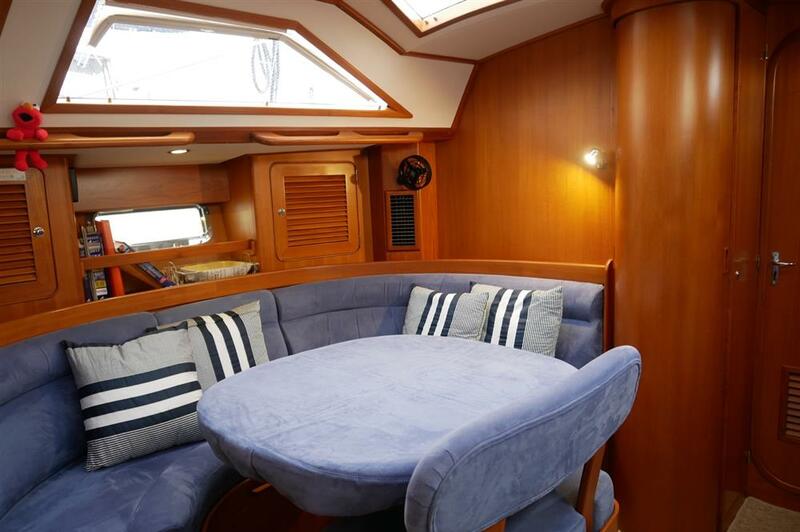 Cruising speed: 6.5 knots (for maximum range) 7.25knots (standard cruising revs) with clean hull. All batteries self contained and strapped. 12vDC automatic bilge pumps in aft lazarette with manual override at helm. Twin pumps in main bilge with manual override at chart table c/w high level alarm. Whale manual bilge pump in cockpit sole. Tank Tender gauge system for monitoring tanks levels both fresh water and 3 diesel tanks, as well as black water tanks. 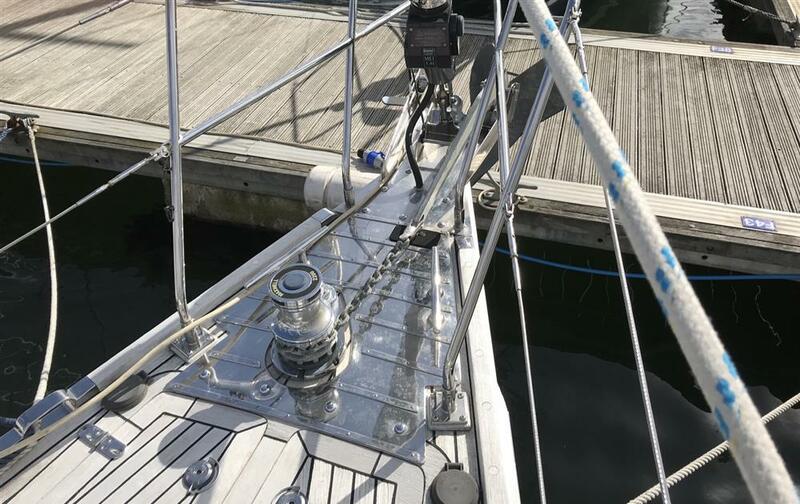 Stainless steel deck fillers for fuel tanks, fresh water tank, and black water discharge. 1x spinnaker in self stow shoot. 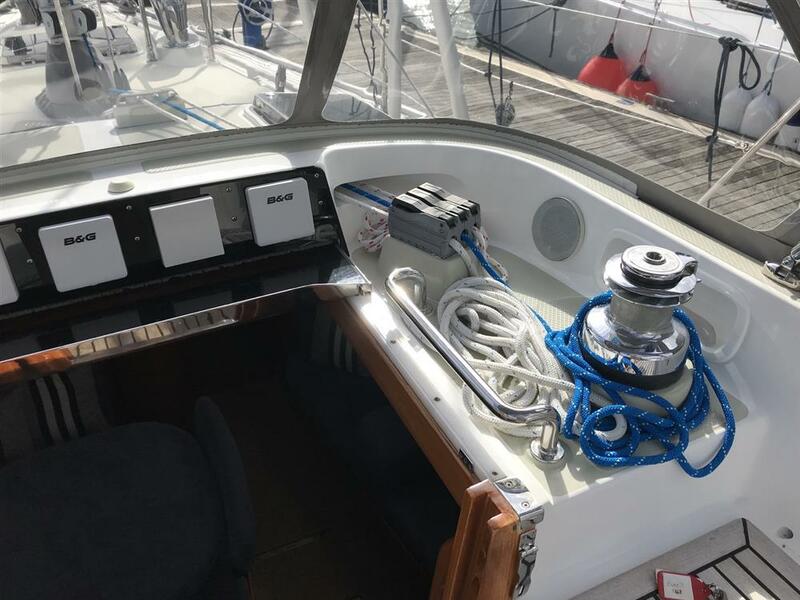 Maxwell Auto Anchor 500C cockpit windlass control with digital chain-counter controlled on deck or at helm. Gas solenoid safety system, switch at chart table and galley. Simrad WR20 radio-control handset for autopilot and Instrument repeater. B&G Go Free wireless system, for operation on iPad. WiFi booster ships system, Unleashed. In forepeak area. Corian counters with sink. Four large storage lockers. Aft of ensuite heads to port. Full double berth 6'9" in length with Pullman berth above. Four large drawers in two rows underneath berth and four lockers above berth. Starboard side 2 hanging lockers and four drawers in between. Solid Teak dinette to port. 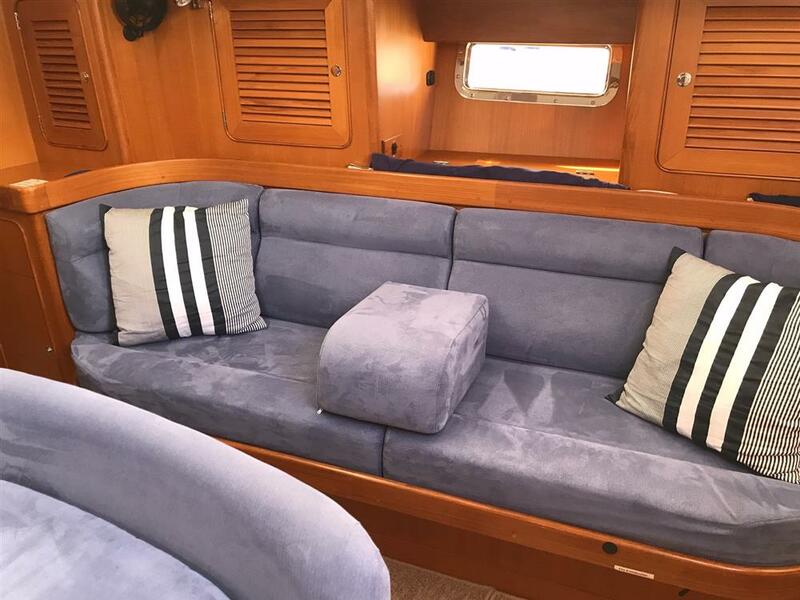 Full length starboard settee pulls out to provide extended passage berth with lee cloth All tankage in main saloon is located below the sole allowing extensive storage under all seating areas and behind the dinette and settee. Double walk through passageway offering optimal ventilation and movement throughout the interior. 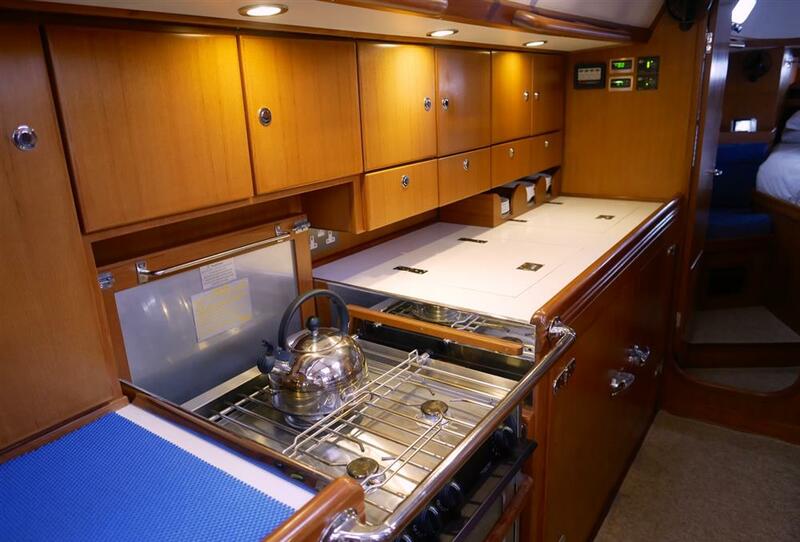 Slide out locker/seat on locking floor tracks with storage for added seating which slides below table when sailing. lockers to each corner of the saloon and bookshelves and a bar unit. 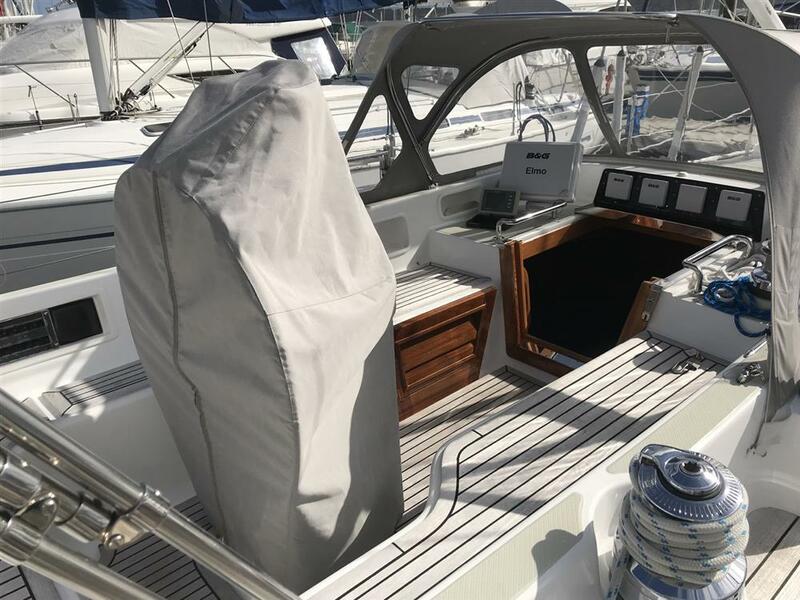 Large hull ports affording excellent outward visibility when seated, whilst the deck-saloon superstructure with side and forward windows, create a spacious and light saloon. Aft of saloon to port. 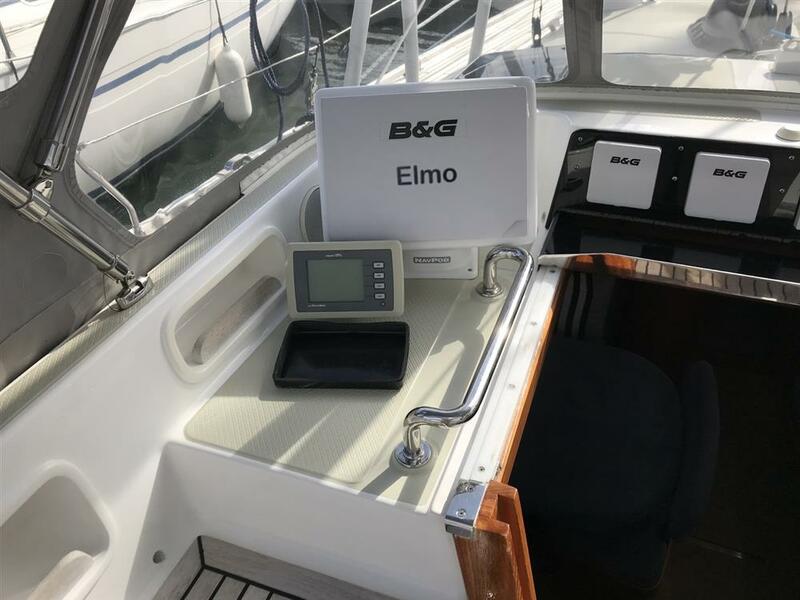 Forward facing Nav Station with full size table to hold folded Admiralty charts or full size Chart Kits. Fast pin access to complete wiring harness and breakers. All instruments and systems well labelled inside and out and traced numerically. Major electrical breakers sited below nav station seat. 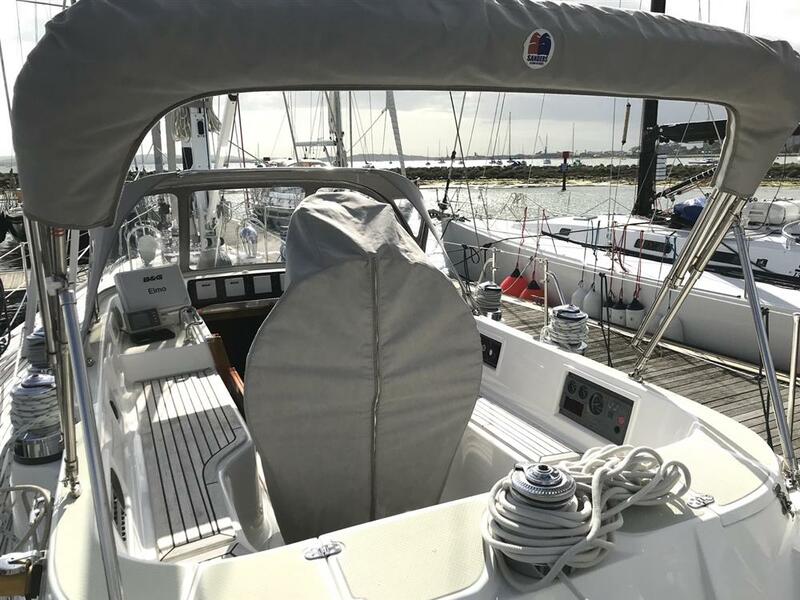 Aft of saloon to starboard, the galley is over 7' in length with a through to aft cabin offering total safety with room to brace on either tack while offshore. Ample cabinets, storage lockers and drawers including full length pantry for cutlery, cookware, and food storage. Slide out trash container with positive locking door. Force 10 cooker with 3 burners, oven and grill. Opposite is a combination Sharp dual microwave/oven. 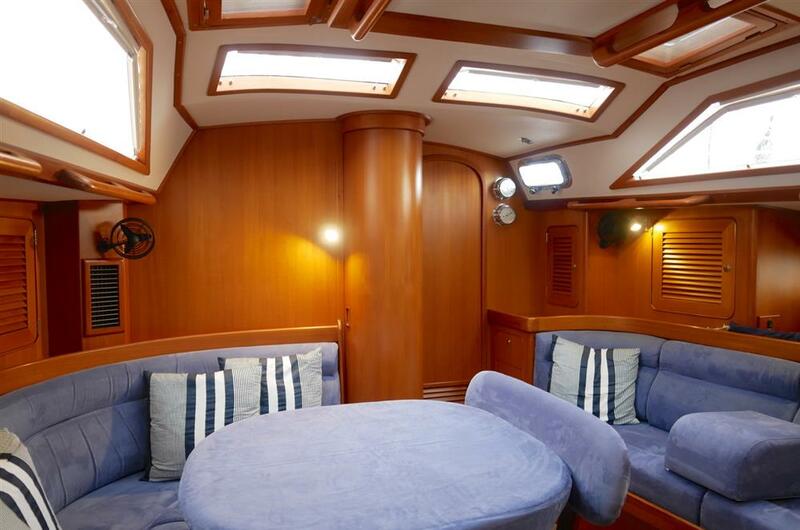 Located in walkthrough from saloon to master cabin on port side. Corian counter with sink. Three large storage lockers over sink top. Dometic electric freshwater marine heads. Shower. 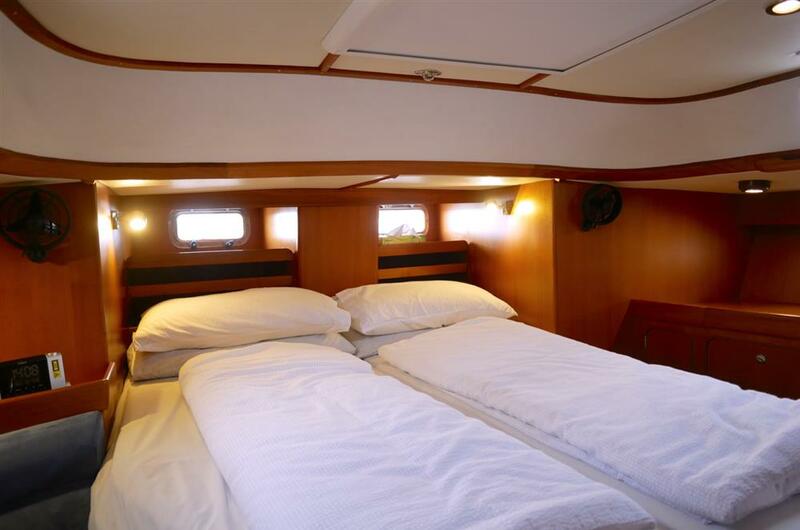 Queen size Aft Berth set near centerline with split mattress split topper and lee cloth, and accompanying starboard side settee. Port side 6 drawers and shoe locker with two large storage lockers under bedside top. 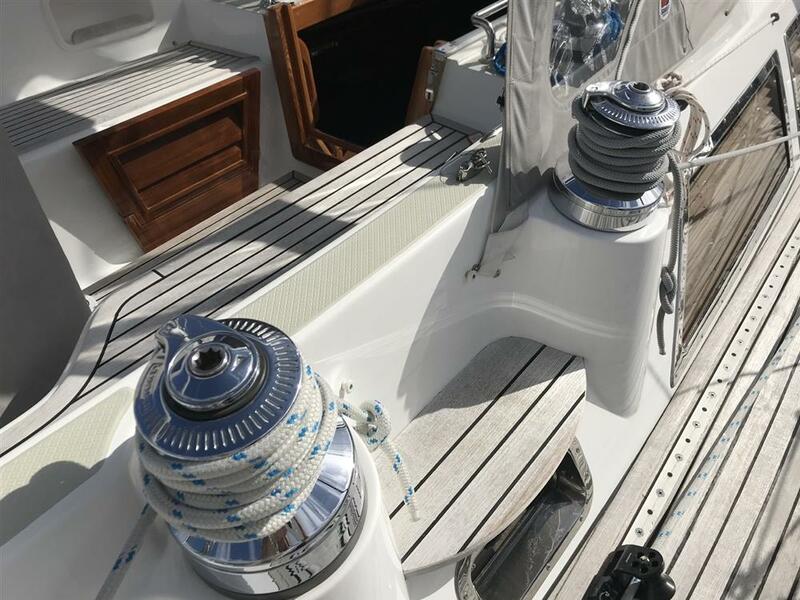 Starboard side double hanging locker. 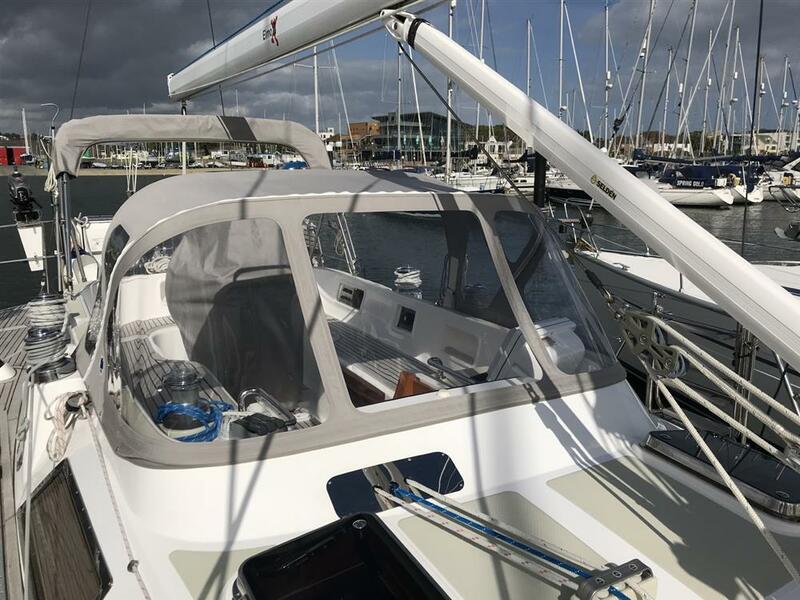 Port vanity with fold up lid with mirror and storage tray on centreline. 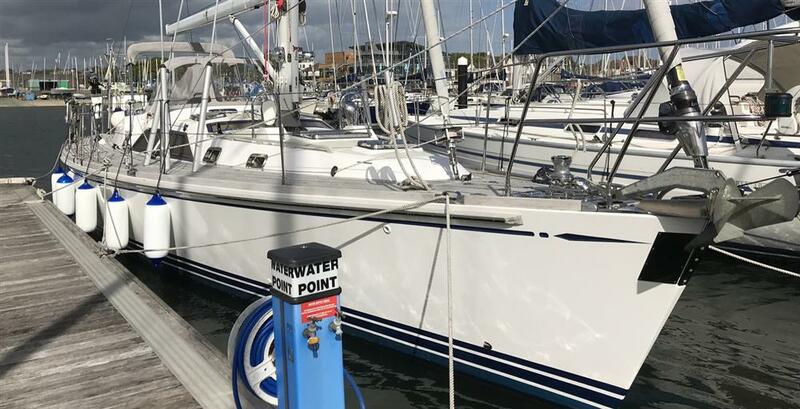 Further stowage available under foot of owners berth. Frigoboat top and front opening fridge & freezer with temp displays. Stainless steel deep sink bowl. Cruiseair reverse-cycle air-conditioning/heating in forward cabin, saloon and aft cabin. Webasto multi vent heating system. Radio/CD player with speakers in saloon, aft cabin and cockpit. Independent volume controls for all three areas. Digital TV electrically raised behind starboard settee. 12vDC LED lights inset to deckhead with additional lights in engine bay, all internal and external lockers.